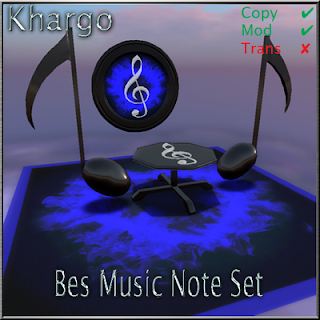 The popular Bes Music Note Chair has been updated to a full set including table, frame and rug. The Music Note Chair has 6 sit animations and the Music Note Table now has 6 dance animations (cos you gotta dance on the tables - right? :) ) The Bes Music Note Set is perfect for clubs, venues or in the home of any music lover. All items are now copy/mod so you can rez as many as you like since they are superlow prim and made using the best sculpties, scripts and animated poses you can find in SL.